Criticism of the Daily Herald began after the paper published two controversial op-eds by student M. Dzhali Maier. The first, published October 5, discussed race, privilege, and agricultural development. 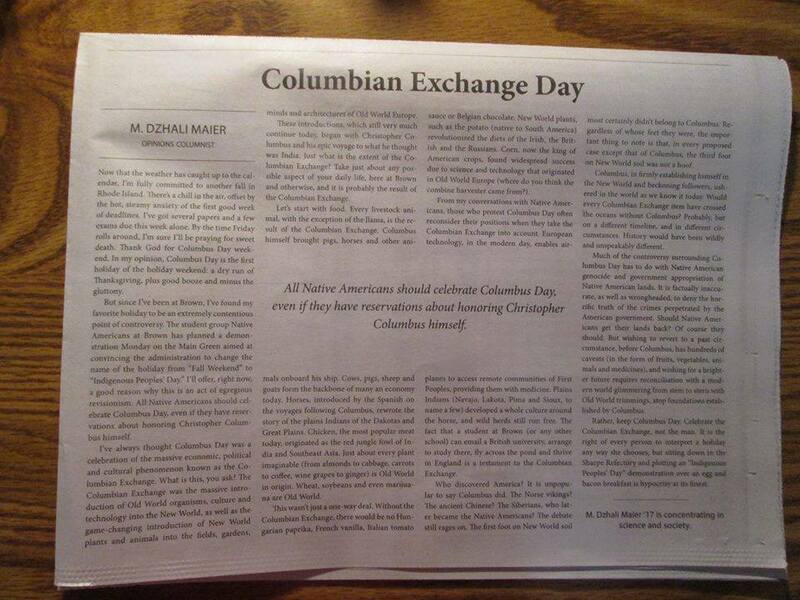 The second—which appears to be archived here but is no longer accessible via the Daily Herald’s archives—was published the following day and concerned Native Americans’ relationship with Columbus Day. A commitment to the free exchange of ideas must be unqualified; in order to truly embrace the ideal of free inquiry, the entire campus community must be willing to engage with all ideas, especially ones they oppose. Many of the individuals calling for censorship are motivated by a bona fide commitment to social justice. What these individuals fail to understand is that freedom of speech is one of the most fundamental tools for promoting social change. It was only with the protection of free speech that civil rights activists in the 1950s and 1960s were able to protest injustice and bring about powerful changes in society. Censorship is a tool of oppressors; those who strive to overcome oppression should not adopt the same tactics of the institutions they criticize. Disregarding the fact that such a standard would be impossible to determine objectively, the more pressing issue is how students deal with speech that offends them. As Former Supreme Court Justice Louis Brandeis put it, when confronted with opposing viewpoints, “the remedy to be applied is more speech, not enforced silence.” Open dialogue forces us to critically examine our own beliefs and leads to the discovery of knowledge. Especially with the FIRE Debates series starting at Texas A&M on October 20, we here at FIRE hope more students stand up for the rights of newspapers, debate societies, and lecturers to express and challenge all opinions that come their way.